Whether it is called ‘Shared Space’, ‘Shared Streets’ or ‘designing for negotiation’, the principle remains the same. By blurring the designation between pavements and roads, the experience for pedestrians can be hugely improved, without total detriment to motorists. New Road in Brighton re-opened in 2007 after £1 million was spent on improvement works. The scheme, by Landscape Projects and Gehl Architects, embraced the shared space concept. Pedestrians love it; motorists can at least use it. One of the country’s most significant streets, Exhibition Road in South Kensington, has just undergone similar treatment. Exhibition Road takes its name from the Great Exhibition of 1851, from which surplus funds were used to build what are now known as the Natural History Museum, Science Museum and Victoria & Albert Museum. These three majestic museums, along with the Royal Albert Hall, Imperial College and many other noble institutions populate the area – as do millions of visitors every year. 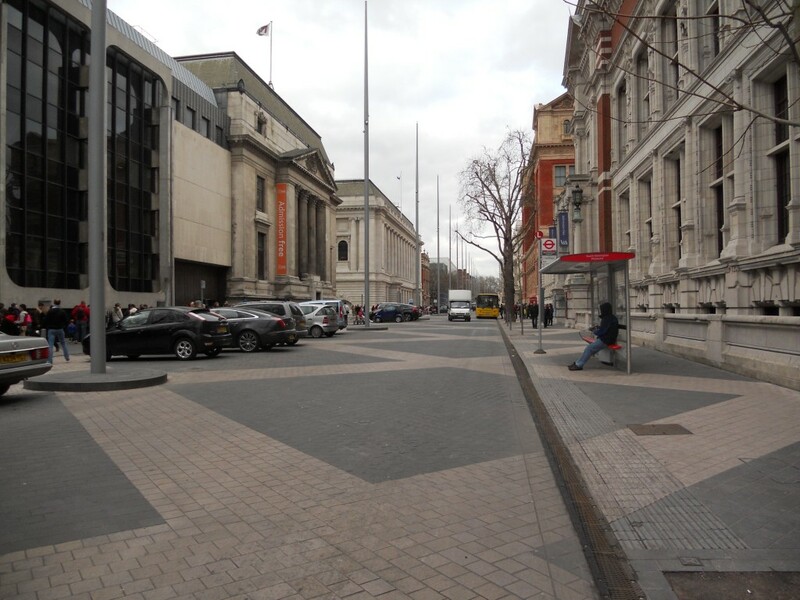 The remodelled Exhibition Road was opened to much acclaim on 1st February 2012, on time and on budget. Admittedly, that budget was £29 million. As is the case with New Road, tarmac and concrete have been replaced with granite; continuity instead of curbs. Lamp posts remain though they are now called ‘street lighting masts’, whatever that means (presumably that is where some of the PR budget went). I visited Exhibition Road during half-term when there were kids aplenty. Whilst it is a huge improvement on the traffic-ridden thoroughfare that I remember as a child, it is no New Road. Whilst black diagonal lines provide relief from the rather bland grey blocks, it is just not exciting. New Road has few cars. Exhibition Road has a constant stream of vehicles, and dozens more in residents’ parking bays. 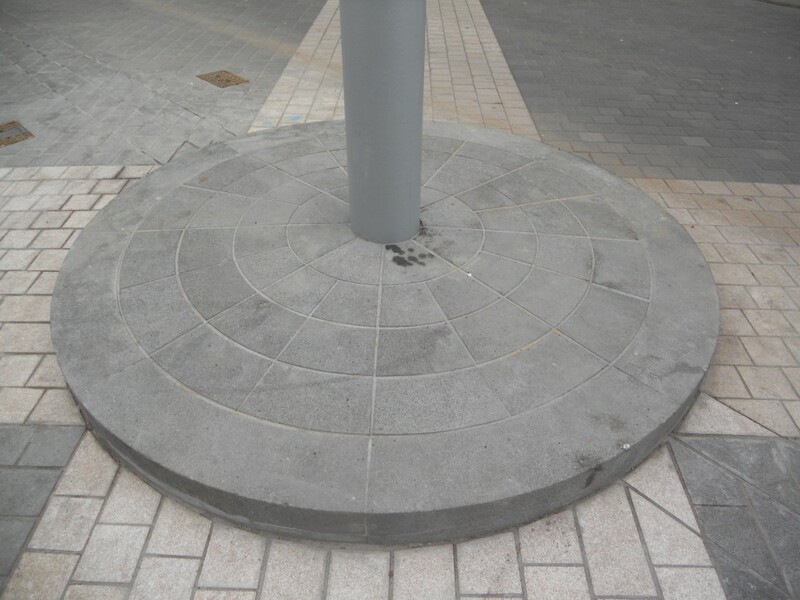 Annoyingly of all, its lamp posts have large raised bases, in total contradiction of the no-clutter rule. To be constructive, I would advocate that Exhibition Road should have been made one-way and the suggested area for cars should have weaved from side to side, rather than being straight like a normal road. Each may well have encouraged more sharing. Admittedly, the speed limit has been lowered to 20mph, but this is just not enough. Shared Space may be attributed to the Dutch traffic engineer Hans Monderman who died in 2008. Exhibition Road, as an exhibition for the concept, needed just that little bit extra to really do his memory justice.